A nursery can be a very lucrative business, but this can’t be your primary drive for buying one. It may seem like a job filled with fun, games and play, but professional standards are high in this sector. You will not only be responsible for the physical and emotional welfare of the children attending your nursery but as an owner-manager, you will have to set an example to your staff. You will need to be punctual, enthusiastic, polite and rigorous about adhering to the directives set by Ofsted (The Office for Standards in Education). When dealing with parents you will have to demonstrate that you are discreet and circumspect and keep meticulous records of the children’s developments and special requirements. Do you have respect for authority? When you buy a nursery, you will be buying a business that is nationally regulated. Ofsted is responsible for regulating and inspecting child minders and day-care providers and operate out of six regional offices. Obviously, you will want to buy a nursery that has all the requirements in place – but you will have to ensure standards are maintained and that any new directives are quickly incorporated. Ofsted will produce a report on your nursery that will be publically available, so seeing this as a marketing opportunity is obviously a better approach than doing the bare minimum to stay legal. Areas scrutinised by Ofsted will be calibre of staff, staff/child ratios, space, resources, health and safety, appropriate activities for emotional, physical and social development, special needs, child protection procedures and record keeping. Maintaining a good relationship with your Ofsted inspectors and cultivating transparency in your dealings with them, will ensure your reputation shines. Most parents are very nervous about leaving their children at a nursery for the first time (in fact they are usually in a worse state than their offspring after drop-off!). It is vital that you are approachable and empathic regarding any worries or special requests. You will have to listen attentively to how Lily is sensitive to noise, Milo won’t eat tomatoes and Theo has to have his ‘blankey’ at all times. More seriously though, you will likely have children with special needs and as conditions such as Asperger’s, ADHD (Attention Deficit Disorder) and dyslexia are rarely diagnosed before the age of seven, you will have to remain sensitive at all times to unusual behaviour may be an early indicator. Getting to know your charges – their characters and idiosyncrasies - will be vital in the smooth running of your nursery, but also in reassuring parents that their children are in the right place. Operating an open door policy (parents can drop in whenever they want) will also foster confidence. Do you know your local area? It is crucial that your local demographic contains a lot of young families. Around 80% of clients of any nursery come from within a five mile radius, and it would be useful to be placed near good transport links for parents who want to drop and pick-up their children on their daily commute. Make sure there are not too many other successful nurseries in the area – they may have popped up after the nursery you are buying was established, and the strain of the competition might be the reason for the sale. Coming up with inventive and fun ways to incorporate early learning goals into the nursery day requires a great deal of creativity. 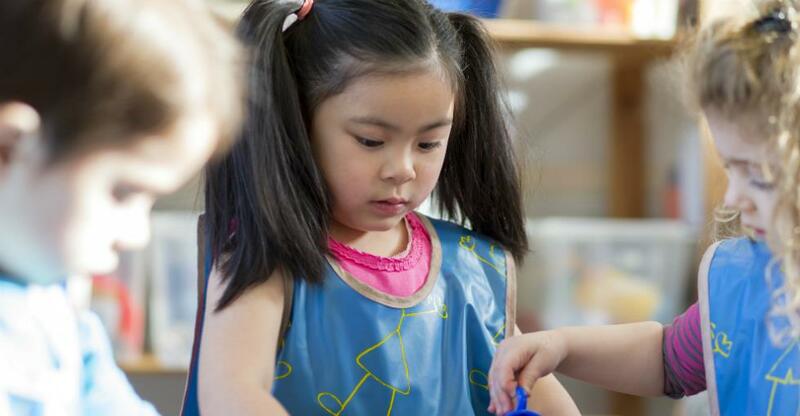 There are endless ways that early numeracy, literacy and personal development can be incorporated into artistic projects or with creative play, and a successful nursery will maintain a range of stimulating activities at all times. You will need to encourage your staff to come up with projects, but also have a strong resource centre. Parents and children alike will respond well to a bright, colourful environment with the children’s masterpieces decorating the walls and a regularly changed range of activities. The same plastic dinosaurs and stickle-brinks plonked on a table day after day will soon raise eyebrows. Are the right elements in place? When you choose a nursery to buy, you want a reasonable income from the offset. There should be a good level of expertise and experience from any existing staff and some established contacts with parents, schools and regulatory bodies. The building should have safe parking and ideally some decent outdoor space for active play. You should get a feel when you walk into the nursery that things are well-run – a calm and welcoming environment will suggest that effective routines are in place. Do you have strong principles? In 2012 the Department of Education presented the principles it regarded as key to the EYFS (Early Years Foundation Stage). The principles are grouped into four themes – a ‘unique child’ (promoting confidence and resilience), ‘positive relationships’ (fostering independence based on secure relationships), ‘enabling environments’ (appropriate facilities) and ‘learning and development’ (acknowledging that children develop in different ways and at different rates, and that all areas of learning are equally important and inter-connected). Physical, cognitive, linguistic, social and emotional development are all given equal footing in this directive and it’s important that, as a nursery owner that you have a firm grasp of how you intend to deliver these building blocks of learning. The best marketing tool for your nursery will be your positive, physical presence. Make sure that you are there to meet every prospective parent to show them around, and give them plenty of your time. Be available to your staff and ensure they are confident in your leadership. Build relationships with local businesses whose employees may need your services and make yourself known to the area’s estate agents who will frequently be asked about good local nurseries. Foster positive links with your community – have open days, and organise trips to local shows, museums and parks. You will find that the personal touch will be the key to your nursery’s success.